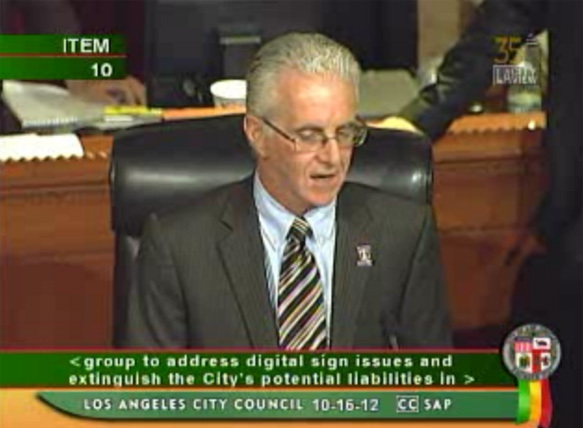 Councilman Paul Krekorian speaking at City Council meeting on digital billboard motion. Note: On Nov. 1, Los Angeles City Councilman Paul Krekorian posted a message on his Facebook Page that used insulting language to describe opponents of a digital billboard motion he introduced. The Councilman’s posting also contained serious misinformation, and the following is in response to that message. Text here. First, I am disturbed about your use of the words “extremism” and “screeching voice” in reference to those of us who opposed adoption of your motion. This is an unfair characterization of the majority of speakers at the Oct. 16 City Council meeting, and of those who sent me copies of e-mails sent to you and other City Council members on this issue. We disagreed with your position and exercised our right and responsibility as citizens to speak out, and such characterizations send a message that our voices are unwelcome and not worth listening to. Second, I believe your posting contains misleading statements about this important issue. The most serious is that the motion calls for “the beginning of a discussion” about the options available to the council for billboard reduction, revenue sharing, and resolution of current litigation. In fact, the motion explicitly calls for city staff to develop draft legislation and draft binding legal agreements with billboard companies within 30 days, which can hardly be called the beginning a discussion about “options” available to the council. And even more significantly, the motion calls for this draft legislation to “resolve” issues relating to the legality of the permits issued for the 100 digital billboards now operating in the city. I’m sure you’re well aware of the fact that Clear Channel has been lobbying city council offices and the City Attorney’s office for well over a year to adopt an agreement that would permanently legalize those 100 billboards in advance of an Appeals Court ruling on the question of whether the permits should be revoked. This is not speculation, but is clearly evidenced by letters publicly filed with the court. So when your motion was brought to the City Council in the minimum time required by the Brown Act, without any hearing in committee, and when it was later revealed by the L.A. Times that the motion was drafted by a Clear Channel lobbyist, it was very hard not to believe that the central intent was to get an agreement in place that would preserve the 100 digital billboards in advance of a potentially adverse ruling from the court. As I have stated in comment before the City Council on your motion, the organization I head is not opposed to discussing billboard reduction and revenue sharing in the context of digital billboard regulation. The suggestion that those of us who opposed your motion were showing “contempt” for any discussion of ideas is not only unfair but untrue. We were in fact calling for respect of public process, a respect that the City Council unfortunately failed to show in 2006 when it approved the lawsuit settlement allowing the digital billboards without any public input or debate. However, we adamantly believe that the city should not enter into any legal agreements with the billboard companies until after the Appeals Court makes a final ruling. The court has signaled its intention to order the revocation of the permits issued for the 100 digital billboards, and if that proves to be the court’s final ruling those billboards should be turned off. Our position has been in the past that off-site digital signage should only be allowed in sign districts, but if the City Council deems it desirable to allow digital billboards elsewhere in the city, it should then develop detailed regulations regarding the numbers of billboards, proximity to residences, hours of operation, duration of ads, brightness, environmental impact, and permitting process, among other regulatory details. At the same time, the City Council can also develop agreements for takedown of conventional billboards and revenue sharing with the companies. All of this, of course, with full public hearings and public input. At that point, any billboard company could apply for permits to digitize existing billboards, including Clear Channel and CBS Outdoor, and if one or more of the 100 digital billboards can comply with those regulations, it could be put back in operation. If not, it would have to be converted back to its original static configuration. This is reasonable, equitable, and respects both the legal and public processes. Anything else does not.